This fall the Network in Solidarity with the People of Guatemala (NISGUA) and the Association of Communities for Development and the Defense of Land and Natural Resources (ACODET) visit the Pacific Northwest, sharing stories of community-based organizing and resistance to the Xalalá Hydroelectric Dam – a government imposed project that would, if constructed, irreparably damage the land, livelihoods and culture of nearly 100 Maya Q’eqchi’ indigenous communities in Guatemala. 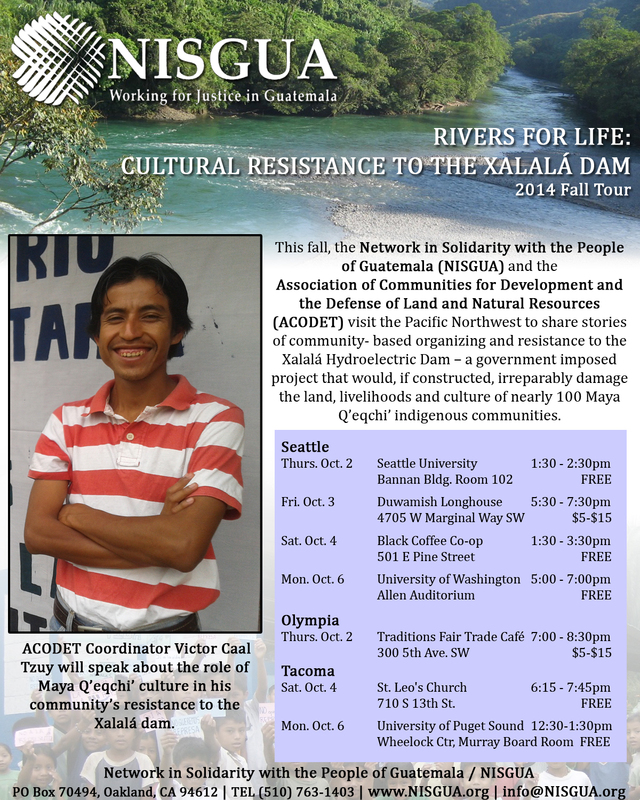 ACODET Coordinator Victor Caal Tzuy will speak about the role of Maya Q’eqchi’ culture in his community’s resistance to the Xalalá dam. Events sponsored by Seattle University Latin American Studies Program, University of Washington Latin American and Caribbean Studies Department, University of Washington American Indian Studies Department, and University of Puget Sound Latin American Studies Program. Victor Caal Tuzy is an educator, a community organizer, a human rights defender, and a founding member of ACODET. For over 30 years, NISGUA has linked people in the U.S. and Guatemala in the grassroots global struggle for justice, human dignity, and respect for the Earth. Learn more at: www.NISGUA.org Or follow us on Facebook and Twitter!